Serbia has a lot to offer to hedonists and eating out to catch local flavors is an unforgettable experience and a highlight for many visitors. When spending time in Belgrade or elsewhere in Serbia, make sure you try the local dishes. The coffee, hamburgers, pizzas are not the same as you're used to at home, but they are terrific. Be prepared for the difference and enjoy it. The prices are low for western visitors, so go ahead, indulge yourself. Be aware though, if you are a vegetarian Serbia might not be the right place for you! Serbian cuisine is a reflection of historical influences in this area, where Oriental and Slavic tastes are dominant. Local favorites are ćevapčići (small rolls of mixed minced meat), which are eaten with plain onions and warm bread. 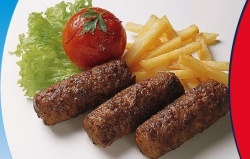 Pljeskavica, another extremely popular and tasty dish, is the actual ancestor of the hamburger, minced meat sprinkled with spices and grilled like beef steak. You will come across all kinds of grilled meat, sarma (stuffed cabbage, minced beef and pork with rice enveloped in pickled cabbage or vine leaves), stuffed peppers, Serbian beans, podvarak (roast meat in sauerkraut), musaka (minced pork or beef mixed with eggs and potatoes and then baked), gibanica (pastry leaves mixed with eggs, cheese and then baked), proja (corn bread), etc. The famous home grown spirits are šljivovica (plum brandy) and lozovača (grape brandy). The choice of wines is not great and you will find that contrary to expectations, good wines are significantly more expensive than in EU countries or the US. There are some great wines produced in Serbia, but most of those come at a price too. If you are a wine lover, have a look at our Serbian wine page. The cuisine of Serbia is influenced by its Balkan neighbours. Traditional food includes soups, stews, smoked meats, minced meat ( cevapcici and meatballs), stuffed vegetables (such as peppers) and kebabs. A dish of mixed grilled meat is a speciality. Fish is used in chowders and is grilled and fried. Bread and side salads are eaten with starters and main courses. Salads are made from a variety of fresh and pickled vegetables such as beans, cucumbers, onions, peppers tomatoes and sauerkraut.Fruit and nuts are used in desserts, for example, strudels, pancakes and pastries. Alcoholic drinks are wine, beer and brandy; plum brandy ( šljivovica ) and grape brandy (Lozova rakija) are popular. Coffee is usually Turkish or espresso. Fruit juices are produced locally. Beer in Serbia ( pivo ) is rarely mentioned outside of its state, regardless of its quality. Beer is mostly sold in half litre bottles; cans are less common and canned beer could be of slightly better quality. Recently, most breweries began packing beer in plastic bottles of 1.5 or even two litres. This beer is cheaper though equal in quality. However, it must be drunk fast! Most beer that is produced are lagers. Stouts are rare (almost every larger brewery produces dark beer but in such small quantities that it is hard to find it). The most popular local beers are "Jelen" and "Lav"
Should you be lucky enough to be invited to a dinner with a Serbian family, do not hesitate to accept! Such an invitation is always sincere, eating home-cooking meals always opens a whole new spectrum of tastes and flavors, and šljivovica offered to the guest in a Serbian home is always pure, strong and natural! If invited to a Serbian home, make sure you check out our Serbian customs and manners page.